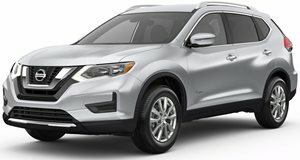 The 2017 Nissan Rogue Hybrid is powered by a 2.0-liter gasoline engine and electric motor to produce 176 hp. A CVT transmission is standard with all-wheel drive an option. Performance is comparatively poor to rivals but economy figures and the ride quality are commendable. A spacious and well-built interior comes packed with features such as a rearview camera, rear cross traffic alert, blind spot warning and forward emergency braking systems although you will have to opt for the top trim to gain access to the full array of safety systems on offer. The Nissan Rogue is a competent compact SUV with a spacious interior and decent equipment levels. The recent introduction of a hybrid model may appeal to shoppers who are looking to save on long-term running costs without having to compromise on space and features. The Rogue Hybrid offers a high-quality interior with soft touch materials covering most surfaces and a good level of fit and finish. Space is commendable for both the front and rear rows, head and leg room is good for even taller adults although the cargo space is not quite as generous in this model due to the battery pack being situated below the load area. Visibility out the rear is hampered by the design of the pillars and the rearview camera will be frequently relied upon to help avoid any bumps and scrapes. Not unlike the gasoline powered model, the hybrid Rogue is a competent handler when driven within its limits. The ride is generally comfortable and harsh roads do not upset this SUVs composure much. The brakes and steering feel well-weighed and other than a lackluster power delivery thanks to the engine/transmission combination, progress is smooth and unflustered. All-electric driving is also possible up to 75mph and in general the hybrid model feels a bit quieter inside than the gas-powered model. 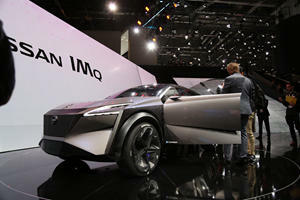 Power is provided by a 141 horsepower 2.0-liter gasoline engine and a 40 hp electric motor. They combine to provide 176 hp and the (CVT) continuously variable transmission does its best to transmit the power to the front wheels. An optional all-wheel drive setup is available and it adds a locking center differential to aid in off-roading driving situations. The additional torque of the electric motor does not help the performance figures much and the Hybrid model posts a similar 9-second 0-60 mph time as the gas-powered variant. Overtaking capabilities are poor and behind rivals like the Toyota RAV4 Hybrid. Where you do gain a benefit is at the pumps where the fuel economy figures are 31/34 mpg in city/highway driving for the AWD Rouge Hybrid and a 33/35 mpg for the FWD version. Both substantially better the 25/32 mpg effort of the gas-powered AWD Rogue. The Nissan Rogue Hybrid is available in SV and SL trim levels. Base SV trim offers a rearview camera, 5-inch display, cargo management system, LED daytime running lights and a range of safety features such as rear cross traffic alert, blind spot warning and forward emergency braking. Rear privacy glass, roof rails and body-colored heated and power exterior mirrors, 17-inch wheels, dual zone climate control, 6-way power driver seat and intelligent key with remote engine starting, are also standard. The SV Premium Package features include a navigation system, adaptive cruise control, around view monitor and hands-free liftgate. The SV Sun and Sound Package includes the Premium Package contents and adds a panoramic moonroof and Bose audio system. A third row of seats can also be specified. SL trim adds a number of the SV Premium Package features as well as leather upholstery (quilted leather on the Platinum Reserve Package), 7-inch touchscreen and Nissan connect telematics. The SL Platinum Package add 19-inch wheels, intelligent cruise control, lane departure warning and forward emergency braking. The Nissan Rogue Hybrid drives, looks and feels very similar manner to the standard Rogue, this means a comfortable ride and plenty of interior space with a good range of available features. It also means that performance and handling levels are below the class average, although in this case you do benefit from significantly improved fuel economy figures. The decent standard safety equipment and availability of a third row of seats should appeal to family-minded shoppers and the small premium charged for the hybrid drivetrain makes recouping the extra cost a viable proposition.